Welcome readers, in this tutorial, we will explore the crud operations in spring boot module of the spring framework. Now, open the eclipse ide and let us see how to implement this tutorial in the spring boot module using the jpa-starter library to communicate with a relational database. Here, we specify the dependencies for the Spring Boot, Spring Boot JPA, and MySQL connector. Maven will automatically resolve the other dependencies. The updated file will have the following code. Create a new properties file at the location: Springbootcrudoperation/src/main/resources/ and add the following code to it. Add the following code the main class to bootstrap the application from the main method. Always remember, the entry point of the spring boot application is the class containing @SpringBootApplication annotation and the static main method. // To increase speed and save sql statement execution time. Add the following code to the Dao interface that extends the JPA repository to automatically handle the crud queries. Add the following code to the service class where we will call the methods of the Dao interface to handle the sql operations. Add the following code to the controller class designed to handle the incoming requests. The class is annotated with the @RestController annotation where every method returns a domain object as a json response instead of a view. // Required for the "where" clause in the sql query template. Open the postman tool and hit the following urls to display the data in the json format. 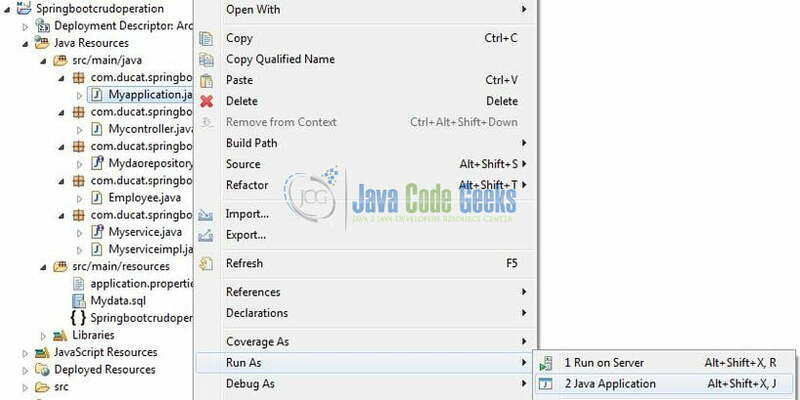 In this section, developers learned how to create a spring boot application and perform the basic crud operations using the spring-jpa-starter library. Few more. . . . . . . 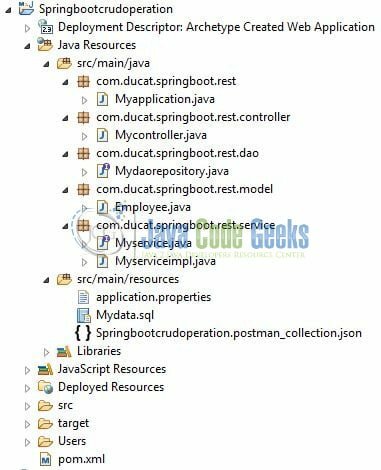 This was an example of performing the crud operations using the spring boot module of the spring framework. 166,407 insiders are already enjoying weekly updates and complimentary whitepapers!